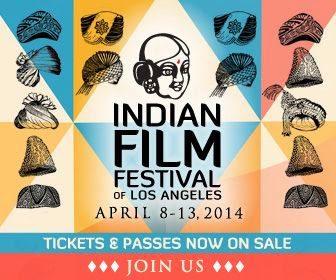 The 2014 Indian Film Festival of Los Angeles returns Tuesday, April 8th to the 13th to the Arclight Theaters in Hollywood. The program includes big productions, independent films, shorts, and documentaries. The red carpet, opening and closing ceremony comes with a very festive celebration with Indian filmmakers and stars. All know that India is the biggest movie producer in the world; every year this festival brings to the city a great quality of films. Last year we had the presentation of the films of two great women filmmakers: Mira Nair’s “The Reluctant Fundamentalist” and Deepa Metha’s “Midnight’s Children”. Film: "Sold." Photo courtesy of Indian Film Festival LA. This year the opening night film is “SOLD” produced by Academy Award Winner Emma Thomson. The story is about a little girl from Nepal sold into prostitution. A must see! “Before my Eyes,” “Ugly,” “The Auction House,” “Hank and Asha,” “Writers,” “Shepherds of Paradise,” and “Brahmin” are among the feature films the festival will present. “Monsoon Shootout” and “Bombay Talkies” are the Bollywood night’s section, the shows are Friday and Saturday at 10:00 PM. The Indian cinema, culture, music, and dances are right here in the palm of your hand. Enjoy!! !